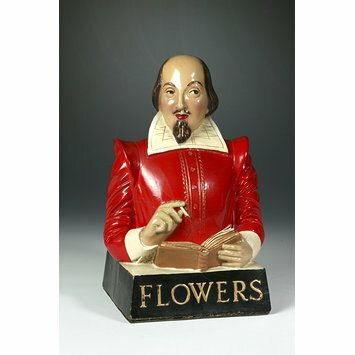 This papier-mâché bust of Shakespeare is an advertisement. It was intended for display on bar counters to promote Flower’s Ale. An image of Shakespeare, based on the memorial bust by Gheerart Janssen in Holy Trinity Church at Stratford-upon-Avon, became the logo of the Stratford-based brewing company. The bust is a jauntier version. The Flowers family had a long association with Shakespeare. The brewery’s founder, Edward Fordham Flower, was a major financial contributor to the Shakespeare Tercentenary Celebrations held in Stratford in 1864. His son, Charles Edward Flower, who took over as head of the brewing firm after his father’s death in 1883, bought land beside the River Avon and donated it to Stratford Town Council as a site for a Shakespeare Memorial Theatre. His generosity did not stop there: in addition to a cash sum of £22,700, he gave further land to create gardens around the theatre, together with the freehold of the buildings and cottages opposite, whose rents could be used for the theatre’s maintenance. Completed in 1879, the Memorial Theatre opened with a production of Much Ado About Nothing. From then on, it was used for an annual Shakespeare Festival lasting for several weeks, with its facilities available to local residents for the rest of the year. Charles became chairman of the theatre governors, and his nephew, Archibald, succeeded him. When the theatre burned down in 1926, Sir Archibald Flower led the appeal for funds to rebuild it. His son, Sir Fordham Flower, became chairman of the board of governors for the new theatre. Flower’s brewery was taken over by J.W. Green in 1954, becoming Flower’s Breweries Ltd. In 1968 the company was acquired by Whitbread. Production moved to Whitbread’s Cheltenham brewery and Flower’s beer was no longer made in Stratford. 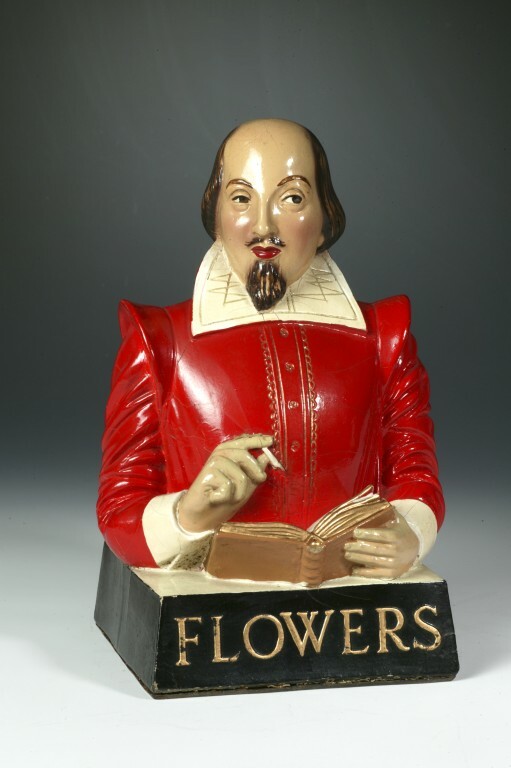 Red painted and varnished papier maché bar-top advertising model bust of Shakespeare, on a rectangular plinth inscribed 'FLOWERS' on the front, in gold raised lettering, this being the brewery associated with Stratford-upon-Avon. He wears a white stand-up collar, white cuffs and a red jacket. He holds a quill in his right hand (the end of the feather is missing) and he is poised to write in a tan-coloured book with top edge and fore edge decorated in gold. In gold raised lettering across front of base. This bust of Shakespeare was produced to be displayed in a pub bar to promote Flowers' beer. Historical significance: This image of Shakespeare is based on the Cotswold stone bust by Gheeerart Janssen (sometimes known as Gerard Johnson) in the monument to Shakespeare in Holy Trinity Church, Stratford-upon-Avon, where Shakespeare is buried. The bust may be a likeness since it was possibly commissioned by his son-in-law, John Hall. Shakespeare's wife, Anne Hathaway, was still alive at the time that the monument was erected (it was in place by 1623), and both these people clearly knew what Shakespeare looked like. Gheeerart Janssen's workshop was in London, close to the Globe theatre, and it is possible that he encountered Shakespeare there. Edward Fordham Flower of the Stratford upon Avon brewing family was the moving spirit behind a Stratford memorial to William Shakespeare. His son, Charles Edward Flower, conceived the idea of a theatre, incorporating a picture gallery, a library and a music room, on the banks of the River Avon. A committee was formed but its first result was a renewal of London's hostility to Stratford's claim to having a special interest in Shakespeare. Nevertheless C.E. Flower issued a national appeal for £20,000 but since the response was poor, the money for the building came largely from his own funds. He also provided the riversite site. Shakespeare is immediately recognisable: a bald head, a pointy beard and a stiff collar. Flowers Brewery, based in Stratford-upon-Avon, has always used Shakespeare as its identifier, incorporating a drawing of the playwright on its labels and beer taps. This bust is a more exaggerated comic version, reflecting a more informal, fun image of the brewery.